I first came across this book on the Human Rescues Dog blog, http://humanrescuesdog.com under the heading Books That Changed My Life. Then, almost immediately, I noticed that Alicia Silverstone has this book as her book club pick on her website http://www.thekindlife.com. So, I decided to read it. I was first drawn to the book by its subtitle : how your diet can help save your life and change the world. Who doesn’t want both of these things? It’s a quick and easy read, there are comparison statistics interspersed with anecdotes and background information about the meat and dairy industries. To be fair, it is easy to enjoy a book that validates my vegetarian lifestyle and does not really challenge any of my values or beliefs. What I especially enjoyed about the book was the tone in which it was written. 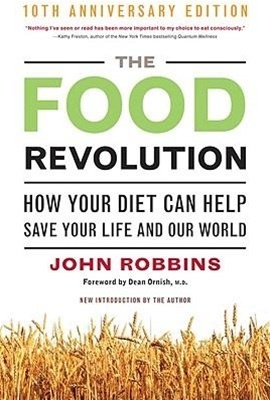 Robbins does not preach to the audience, rather encourages thoughtful contemplation about the impact daily diet choices have on health and wellness. This book changed how I view the publication information that is so readily available from both the meat and dairy industries. It challenges our cultures beliefs about our definition of the four food groups and has really made me question and reflect on my own dairy consumption. Making conscious decisions about the food I am eating, decisions that align with my values and beliefs about a green life and clean eating seems like natural fit. As this is the 10th anniversary of the book, many of the stats are from the ’90’s. This left me wondering about the current state of affairs of the meat and dairy industries as well as the current state of our planet. The optimist in me hopes things are improving, however the practical side of me doubts this. This book has opened my eyes to the impacts our eating habits have, and has confirmed my beliefs about the positive impacts of a plant based diet. Thanks for the link 🙂 Turning vegetarian/vegan was the best thing I’ve done in a long time – I have lost weight, I feel great, and most importantly, I sleep with a clear conscience. I don’t like to preach it; but when my friends or family members saw the change in me, they started experimenting with vegetarianism on their own. Thank you again for the recommendation, you inspired me to write on this book myself! I agree that it is such a healthy lifestyle change both physically and mentally/emotionally. It has been very positive and a great learning experience. I also try to live with grace and by example rather than preach which I think is more the most powerful path as well as the most approachable. Looking forward to reading more of your life changing picks in the future!